One of the most innovative thinkers in the field of Islamic Studies was John Wansbrough (1928-2002), Professor of Semitic Studies and Pro-Director of London University’s School of Oriental and African Studies. Critiquing the traditional accounts of the origins of Islam as historically unreliable and heavily influenced by religious dogma, Wansbrough suggested radically new interpretations very different from the views of both the Muslim orthodoxy and most Western scholars. 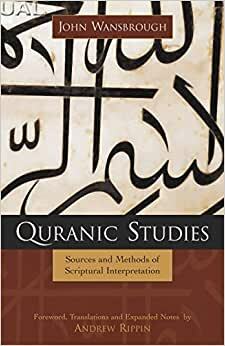 Originally published in 1977, Quranic Studies presents an in-depth textual exegesis of the Quran based on form analysis. Noting the persistent use of monotheistic imagery stemming from Judeo-Christian sources, he interpreted the rise of Islam as the development of what was originally a Judeo-Christian sect. As this sect evolved and differentiated itself from its Judeo-Christian roots, the Quran also evolved and was continuously in flux for over a century. Wansbrough concluded that the canonization of the text that we today call the Quran, and even the emergence of the concept of "Islam," probably did not occur till the end of the eighth century, more than 150 years after the death of Muhammad. Although his work remains controversial to this day, his fresh insights and approaches to the study of Islam continue to inspire scholars. This new edition contains a valuable assessment of Wansbrough’s contributions and many useful textual notes and translations by Andrew Rippin (professor of history, University of Victoria). UPDATE to what I wrote in the paragraph below: This reprint of Wansbrough's pioneering work is made more accessible to the motivated scholar by a section of annotations--these are English translations of the Arabic citations contained within the text-- and a glossary of technical terms used in advanced scholarship. Both of these are provided by Professor Andrew Rippin, whose work has helped to place this text back into print with Prometheus publishing. These appear at the end of the work, so as not to disrupt the flow of the text. Of course, Dr. Rippin does advise there that for those who have absolutely no foundation in any textual, Biblical, or Near Eastern scholarship, and no exposure to Arabic, Hebrew, Latin, Greek, German or French vocabulary, at least those typically found in ancient studies and textual scholarship, This Work Is Not the Place to Start, and I agree entirely. I have put that phrase with capitals to emphasize this point. In fact, Professor Rippin himself has referred to his working through this text multiple times to yield its fruits! Sadly, there are few scholars, and fewer students, with the breadth of Wansbrough's erudition to keep the academic "conversation" laid out in this text thriving, and perhaps still fewer, besides Professor Rippin and a handful of others, with the courage to address these sophisticated issues of textual analysis of Islamic texts stripped of dogmatic or tendentious agendas. But I am adding this update to state that, if one already has something of a background and patience, like I said in my first review, the rewards here are sine qua non. I can't sufficiently describe the hunger I felt for satisfactory secular scholarly analysis of the Qu'ranic text(s); I finally feel like I have the beginnings of the answers, and at least the arguments well laid out. This extra comment is largely directed to my fellow travelers in ancient, classical, and/or religious studies who may have worked to the graduate level or developed a comprehensive background through serious (i.e. academic) study. Whatever you may glean from Wansbrough's essays here, you will have entirely found it worth the effort. I certainly have, and I continue to. This book is a work of scholarship, written by a scholar and for scholars. It presupposes a familiarity not only with classical textual criticism but also elements of Biblical criticism and Near Eastern studies, and the terminology used on the graduate level or higher in the academy. The terminology isn't 'esoteric' or 'exotic,' it is the language of scholarship used to describe very specific complex ideas. As such, there aren't 'soundbytes' or quick 'zingers' to prove anything to anyone, sanguine or skeptic. Rather, it is a mature and sophisticated scholarly approach that relies upon first the assumption that the text may be treated as we find it, and then by use of the tools of textual criticism can be analyzed apart from traditional Muslim exegesis, and in order to do so, "bracketing," to use the academic term, the issues of divine origins and inimitability. It's just as well Wansbrough wasn't inclined to attempt to simplify his work--the shrill noise on either side of this unsurprisingly contentious subject already drowns out serious and sober inquiry not motivated by theological concern or polemic, or at least make it very difficult to track down a reliable body of work not stalked in reviews by the usual partisan crowds. So, if you really are able to read academic works in Biblical Studies and/or classics, and have spent the time and energy to familiarize yourself with Greek, Hebrew and Latin, are familiar with common terms from 20th century biblical scholarship, then this book will hold numerous rewards. Even if you are lacking in some, but not all, of these, you may discern some insight here. I am lucky enough to be in that position, and even more fortunate that there was a scholar willing to put this together during his tenure for the posterity of other motivated scholars not interested in pointless debates about inviolable texts or parrying insults about what is acceptable to study academically and what isn't. This book is not easy to read as it requires much previous knowledge in Islamic studies, history, theology and even some Arabic. However, it presents the reader an excellent expertise on Quranic exegesis with original but well founded theses. I recommend it as a university text. This is a pretty difficult read, but a very strong book on the subject of Islamic studies. A masterpiece I would say. Wansbrough is often mentioned as a pioneer in literary/textual criticism of the Koran. After reading a number of works on the origins and content of the Koran (by Ibn Warraq, Robert Spencer, and others), after reading the Koran itself several times, and after considerable time spent in literary/textual criticism of the Bible, I thought it was time to tackle Wansbrough. To my disappointment, however, I found his book quite unreadable. His English is obscure and laced with words that would stump a Scrabble champion. Then there are the hundreds of passages or terms in the original Arabic, Hebrew, Latin, Greek, and German. Perhaps there is merit buried in this tome, but it might as well have been written in cuneiform. 5.0 out of 5 starsMistake in the Koran? He [i.e. Zul-qarnain] followed, until he reached the setting of the sun. He found it set in a spring of murky water. We agree with Muslim scholars that Zul-qarnain refers to Alexander the Great (see Yusuf Ali's appendix on this subject in his translation of the Qur'an). According to this surah, Alexander the Great traveled west until he found out what happened to the sun. It went down into and under the murky waters of a pond. When it was completely covered by the water, darkness fell upon the earth. To the early Muslims, this surah gave the divine answer as to why darkness fell when the sun set in the West. They assumed that the sun, like the moon, was the size perceived by the human eye, about the size of a basketball. Darkness came when with a mighty hissing roar it went down under the dark waters of a pond. They boldly and proudly proclaimed that this marvelous answer proved that the Qur'an was indeed the Word of God. Today, modern Muslims are quite embarrassed by this passage and try to ignore it or to quickly dismiss it as poetry. But the passage is not part of a poem. Thus it cannot be dismissed as figurative language or poetic license. In the context, it is part of a historical narrative which relates several historical incidences in the life of Alexander the Great. The mistake was based on the erroneous assumption that the earth was flat. The authors of the Qur'an did not know that the earth was a sphere which revolved around the sun.